In the previous video we wrote some edge case tests that cover what happens if we send in an empty title string, or try to say our hot new Album has -5 tracks. Far out, dude. Whilst we are catching these gnarly situations, we aren't really helping our Symfony 4 JSON API consumers as we just say: "status is error, kthxbye!" It would be much nicer if we said yes, this is an error and it's because X, Y, and Z.
Symfony's form has already done about 90% of the hard work for us. It knows what the errors are, and to which fields they apply. But getting that information from Symfony's form component and converting it in to a nice bit of JSON is... not so easy. 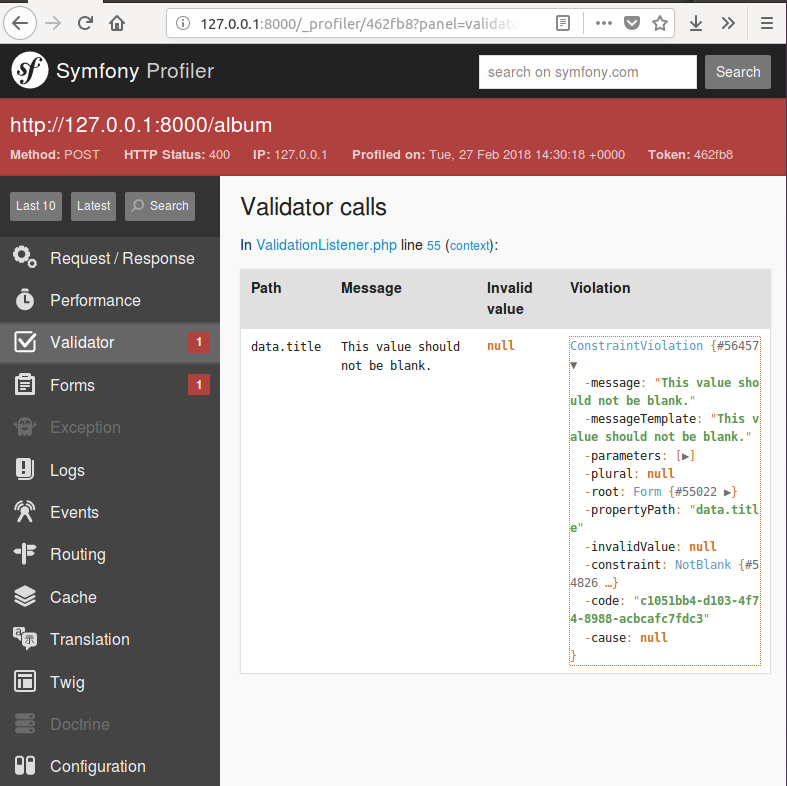 Both FOSRESTBundle, and the Symfony API Platform will take care of this process for you. As we aren't using either of those at this point, we have to handle this problem ourselves. Frustrating. The error message is there. $form->getErrors() is a legit method. But without extra help, this won't render out as JSON. I Just Invented A Round Thing, Which I Call "The Wheel"
I'm not in the habit of reinventing the wheel. I guess that's why I like Symfony, and the vast array of libraries / bundles within the ecosystem. It's also why I like WordPress. For the most part, people much smarter than I have already encountered, and solved (m)any problems I encounter. This is - thankfully - also the case here. The FOSRESTBundle crew have already solved this problem. As have the API Platform team. Each solution is valid. Each is different. * This file is part of the FOSRestBundle package. * Normalizes invalid Form instances. * This code has been taken from JMSSerializer. Which is quite a lot of code, and also, now hopefully a little more evident as to why our naive attempt failed. To get this into our project we could either require the entire friendsofsymfony/rest-bundle. Or we could copy / paste this file over to our project, and update the namespace. I'm going with the second approach, as the idea here is to be as streamlined as possible. We will create an entirely separate implementation that uses Symfony 4 with FOSRESTBundle very shortly. * This file was copied from the FOSRestBundle package. * Serializes invalid Form instances. Feel free to write your own implementation if you'd prefer. Even the original code here is borrowed from another library. Like I say, why reinvent the wheel? Thanks to Symfony 4's autowiring, our new FormErrorSerializer service is now fully operational. Our tests at this point are all still passing. Behat will only check what we tell it to check. The status is still error. From Behat's point of view, that hasn't changed. "This value should be greater than 0." Not only is our API now more fully tested, but the interesting behaviour is captured and becomes living documentation. I love Behat. This is a brilliant file to share with your front end developer(s), as it answers a whole bunch of their questions without them having to bother you. Plus, they can easily work with Gherkin as it's so human friendly. Ok, this was the hardest part of rolling our own Symfony 4 JSON API. Now we need to tackle the remaining verbs: GET, PUT, PATCH, and DELETE.